Why should you subscribe to It’s FOSS Newsletter? If you like what we do here at It’s FOSS, perhaps you might want to visit us on a regular basis to read more articles especially the latest ones. But then it’s a busy world and you might forget to visit us even if you have subscribed to our feed. This is where Newsletter comes into the picture. Even if you forget to visit our website, you’ll find the articles in your email inbox. It’s FOSS Newsletters are the coolest on the block. Don’t believe us? Ask those 45,000 subscribers to our newsletter. The newsletters complement It’s FOSS in a big way. Apart from articles, you also get to learn our new videos, get the exclusive preview to our side projects. Most importantly, the newsletter is written by me personally, each week and it gives you the opportunity to interact with me on a personal level. You’ll never miss out on the best stuff of It’s FOSS with it. 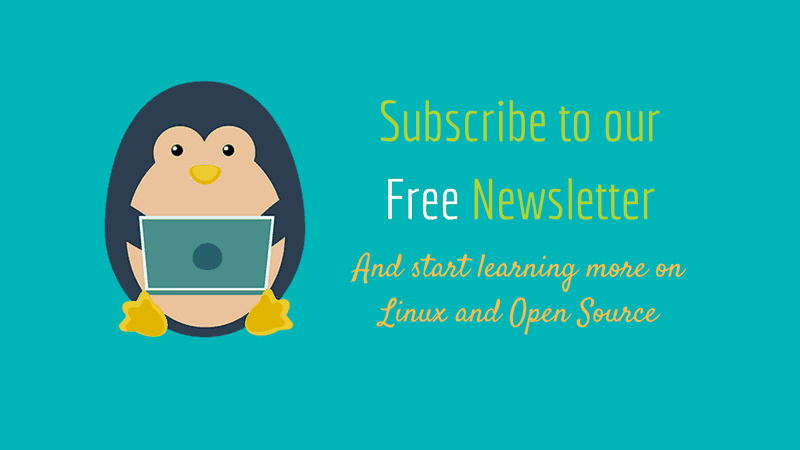 How to subscribe to It’s FOSS Newsletter? There are two kinds of newsletters: Daily and Weekly. 1. Weekly: I personally craft the weekly newsletter. It consists of the best new articles of the week, some of the best articles of the past which you might not have read, important updates from the Linux world, latest videos, book and courses. You can subscribe both Daily and Weekly together. If you think daily emails are a bit too much for your busy schedule, just unsubscribe from the daily. You’ll still receive the weekly. And yes, if you don’t like any of the above newsletters, you can unsubscribe it at any point of time. The unsubscribe link is at the end of each email newsletter sent to you. Your emails are never shared with anyone so once unsubscribed, you won’t hear from us again.